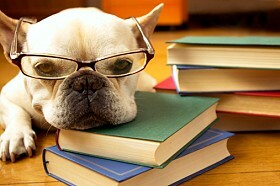 Sunday’s are chore days. I sorted my darks and lights then loaded the washer. Per usual I waited until the last possible moment to do laundry i.e. I’m out of clean underwear. I’ve even been known to go so far as wearing my bikini bottoms in a real pinch. I wish I could tell you this only happened once. And I cannot confirm nor deny whether commando has ever been a consequence of my procrastination. Next I began a recipe I’ve been dying to duplicate since scarfing it down at a restaurant. I chopped cauliflower florets, added almond slices, tossed them in olive oil and salt & Pepper. Then put them into the oven to roast. When my load of laundry was finished I flipped it over to the dryer. At which point I discovered I’d laundered my money. When I was a little girl growing up outside Philly in Mafia country I believed this is what laundering money meant. That if mullah was washed it lost its serial numbers or became suddenly untraceable. I worried that if I forgot to empty my allowance from my jean pockets I could go to jail. Of course today I know this is not true. But I’d left $50 in my pants. That is just irresponsible. I also left a X-mas check inside the book it was gifted with forgetting to deposit it. The giver had to ask me if I’d lost it. Oy! I am definitely not doing justice to the fact that I work in the Financial Investment Field. Now it was time to finish my recipe. I pulled the roasted cauliflower out of the oven. I roasted extra to use for cauliflower rice with the remainder of my leftover Arrabiata Bolognese with spinach and carrot for dinner tonight. 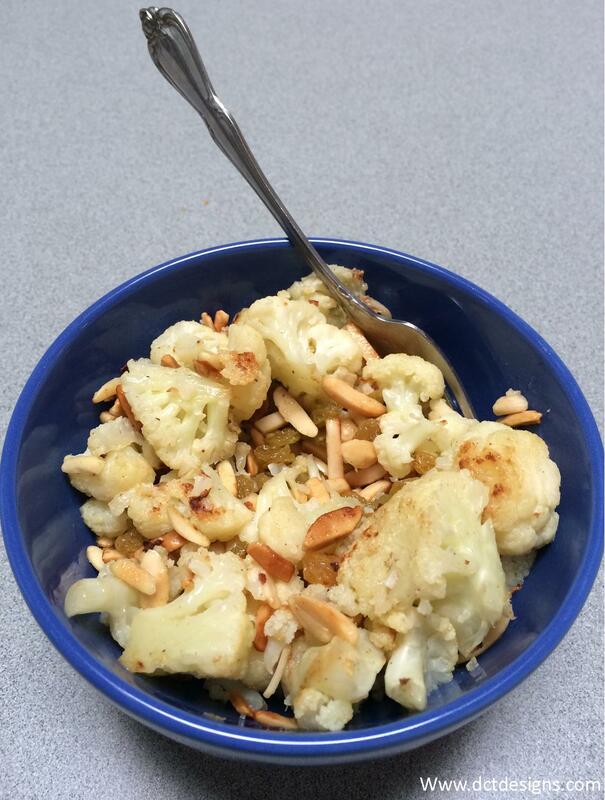 I tossed the roasted cauliflower and almonds with golden raisins and the juice of a Meyer lemon. Hummuna hummuna. I am not a fan of coconut water. But I took the squeezed Meyer lemon rind, placed it in a cup and filled it with water. Then I added just a Tablespoon of coconut water to the mix. This was yummy. 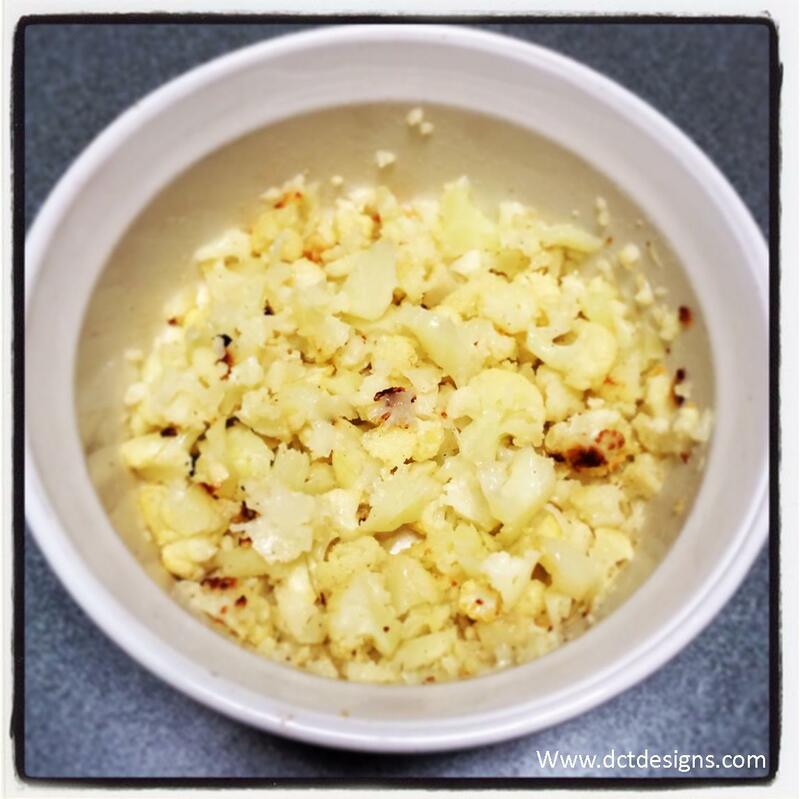 Give it a try for something refreshing and make sure to make your own…..
Place Cauliflower, almond slivers, oil, salt and pepper in a large bowl and toss until coated. Spread out the cauliflower mix onto prepared baking sheet. Roast for 15-20 minutes until edges begin to brown and cauliflower is tender when pierced. Let the cauliflower cool for a few minutes then place back into the bowl you used to toss it originally. Add raisins and lemon juice. Toss it till mixed. Serve. Of course as someone who cooks by eye I say add as much almonds and raisins as look good to you. Same with salt and pepper to taste. I make extra roasted cauliflower. I set the florets aside and then pulse them in a blender or hand chop them into fine rice consistency. It makes the most luscious Cauliflower rice. Try it. Can’t wait to try the recipe!! Have a great week!